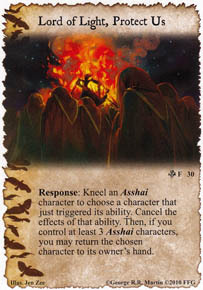 Response: Kneel an Asshai character to choose a character that just triggered its ability. Cancel the effects of that ability. Then, if you control at least 3 Asshai characters, you may return the chosen character to its owner's hand. may it cancel a doubting septa ability? No, since the Septa's ability is passive. You can tell the difference between triggers and passives because triggers are preceded with Bold text whereas passives are not.